During the NPP North American Congress in September 2004, some members who attended the congress had contested in the local primaries in Ghana. 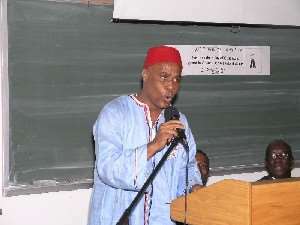 One of them taught the entire participants how to say the NPP slogans correctly, "Kukurudu.............Ewosowoso" , he made a remark about his campaign, the sacrifice he had made, his ordeal, the slandering and the determination to destroy his hard earned reputation by his opponent. He told the audience that all he was trying to do was to serve his country and he was not going to give up and has a great support of the masses. He sounded confident and upbeat of winning the parliamentary election and beating his opponent. He is no other than Joe Kingsley Hackman (NPP), who beat Ama Benyiwaa Doe (NDC) for Gomoa West seat. He has done a great job concerning the magnitude of his opponent who is outspoken, well-known and has held a ministerial position in the NDC government and a three term parliamentarian. Joe had lived in Newark, NJ before heading to Ghana to contest for the Gomoa West seat. His compatriots and friends in Newark are very proud of him and also rejoicing as a result of this magnificent victory. His good friend, Mr. Kofi Bawuah of Universal Shipping, NJ who could not hide his happiness told Ghanaweb that his telephone has constantly been ringing with friends sending congratulatory messages. An exclusive interview with Joe Kingsley Hackman is in the works and would be brought to you soon so stay tuned.